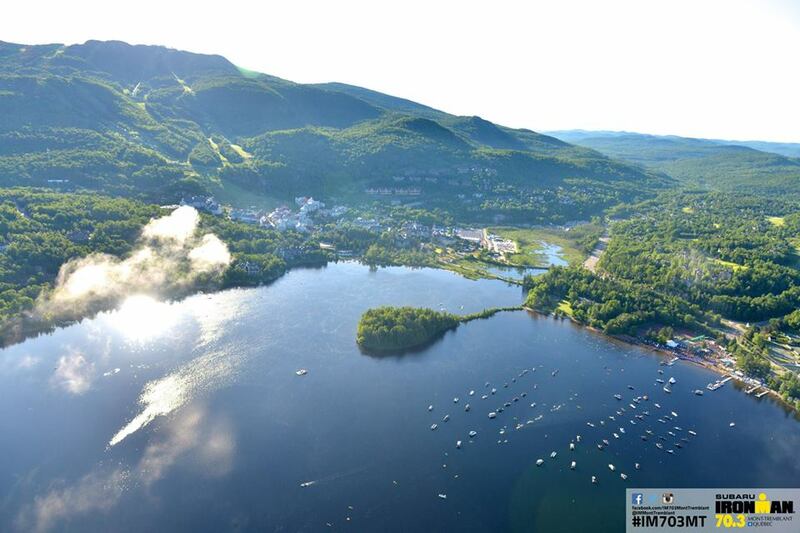 I have just returned from beautiful Mont Tremblant Canada (don’t worry, I’ll include lots of pictures) having just completed the Half Ironman on June 22. As I tell all of my athletes to write a race report, I thought I better practice what I preach. So here we find a description of the events of that day (and weekend) while a wax poetic about life, triathlon, and essential bodily functions. 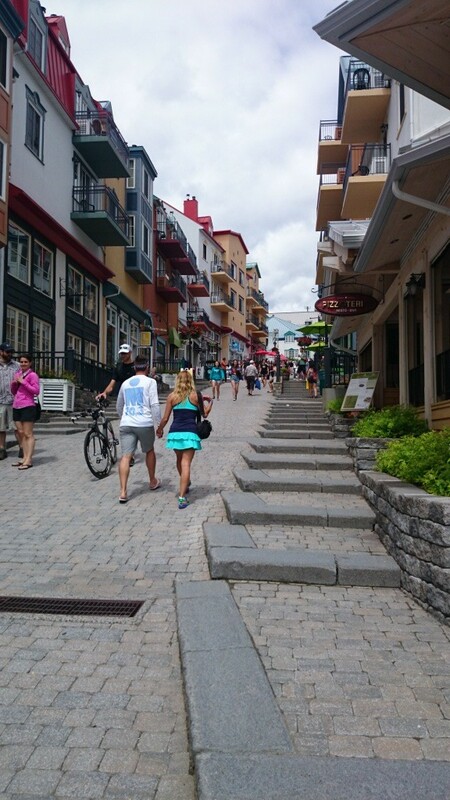 There’s Mont Tremblant nestled at the foot of the mountain, it’s a lot steeper than it looks. Due to an incredibly fortuitous stroke of luck, I had recently been reacquainted with a bunch of my old (some older than others) Minuteman Masters Swim Team friends this winter. And guess what! 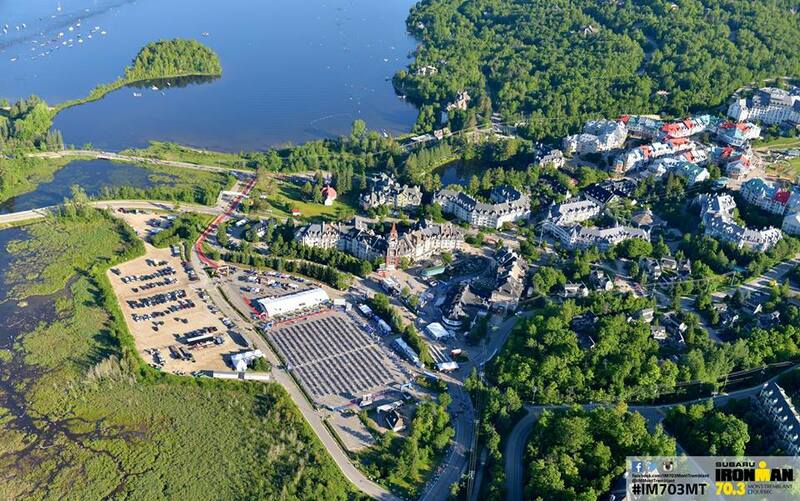 They were doing the half at Mont Tremblant and had some extra floor space, perfect for me! So driving up with Minuteman friends on Friday we avoided the worst of the Montreal afternoon commuter traffic and arrived in darkness. Pretty mysterious coming up to the town seeing lights floating high in the distance, I had really no grasp of what the town was like, besides the lit transition area in the center of town. We eventually found our hotel, met the rest of the crew, and promptly went to sleep. This is from our hotel balcony! The next morning it was time to eat, one of many favorite day before race traditions. Took the cabriolet (ooh la la!) lift down to the center of town and had a nice meal. Food was good, but had to buy a separate meal for one more waffle, could have had another too, but I have some dignity (no I don’t). The town is great, do this race so you can experience it yourself, simple as that. 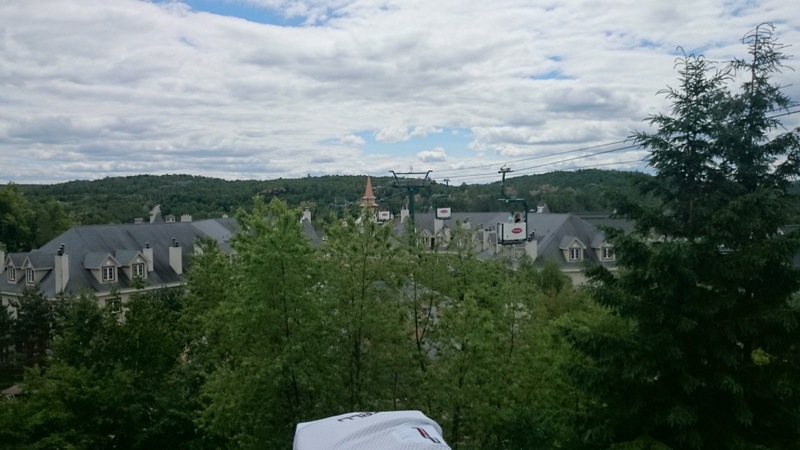 I mean, how many races can you take an open chairlift from your hotel room directly to town!! Then we made the long slog 50 feet from breakfast to registration which was relatively quick. I practiced my horribly bad french and happened to meet a couple working the event who’s favorite place to visit was the outlets in my hometown of Merrimack, NH. Wow I said! (or was it sensationnel? so fluent I think in French 😛 Later I took a drive out of town to pick up lots of pretzels, some compote de pommes (yup yup! ), and bananas. Spent the rest of the day relaxing with everyone getting ready and finally dropped off the bikes. Dinner consisted of take out from the local Italian place and an early time to bed. Swim start – I’m looking ready, right? Race day morning preparation was easy, early to wake, we again took the cabriolet to the race start, can’t really get better than that. Day was perfect, in the 40s with a quickly rising temperature, not much wind. 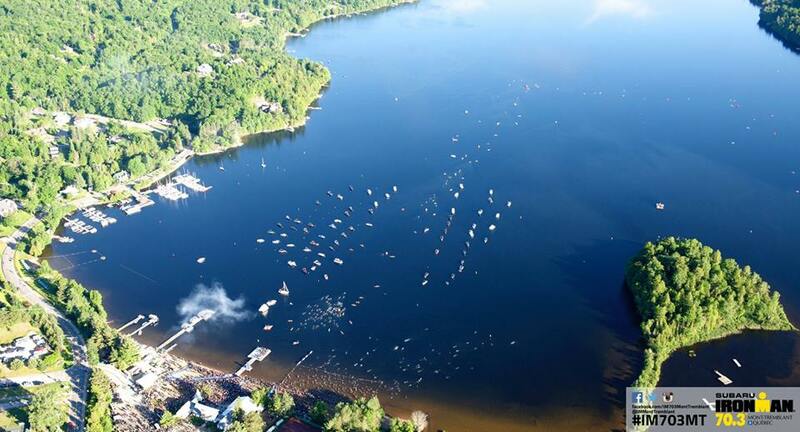 The water was a comfortable low 60s and the swim was setup as basically an out and back, very easy to sight. After about 12 waves ahead of me it was my time! Swim: 34:11 – ok not my best, but! I’ve been having some strange issues with my swim this season, definitely more mental than physical. So I was actually happy with it, definitely played it conservative but was calm throughout. Started on the outside, and a beach start, not my favorite for obvious vertically challenged reasons. Sighting was great, but halfway through I started hitting a lot of waves ahead of me. I don’t think it slowed me down that much, it was more of an annoyance really with being in the back of the wave starts, but such is life. Towards the end of the swim, I definitely stopped swimming too soon and had to muscle through some water while standing, which was especially bad as I had been warned of the long shallow end of the swim, but good knowledge for the Ironman. MT has a long run to transition, but the wetsuit strippers are right there when you get out of the water, so I didn’t even have a chance to get the wetsuit down to my waist. With a bit of a struggle, the wetsuit was off!! Passing several people to transition I felt great running on the red carpet and before you know it, I was on the bike. Run: 1:42:03, 7:47/mile, Avg HR – 169 bpm. So here is the run, we’re we are all reminded that this is a triathlon. Had a great transition and felt great for the first 5 miles. The first 3rd of the run is hilly, middle is flat, last third is hills with a fast finish. I probably took it out a little fast and at the turn around just felt like I was getting slow. I still need some more volume here – but after speaking with Coach Colin we both think I need to really concentrate while running, and keep the cadence up!! which I was not doing . Basically, the same principle that got me to my bike time. I saw friends out on the course, and really enjoyed yelling out eau and glace whenever possible. Wax Poetic – too long and self indulgent 😉 If you’ve spoken with me this season, you probably know I was pretty injured last year, thought I was getting better to only have another setback. So though this was not my best overall time, it was an important one. I coach, and am trying to practice triathlon as a lifetime sport, not a season, or even a couple of seasons, but as a lifestyle. So this means sometimes we as athletes will be up, sometime down, sometimes in between. Though I’m not thrilled that I was injured, it actually taught me a lot, and gave me much insight to injured athletes that I’m coaching. So if you’re injured, don’t do what I did. You’ve got to work HARD, harder than your toughest training to get better. And this probably means possibly taking a season off, or way down in racing. Adjust your goals, because we want to get back strong, but not give up. I’ve seen a lot of that in triathlon lately which is tough to see. I really believe there is almost always a way back from injury, but it’s not easy. OK enough of that!! 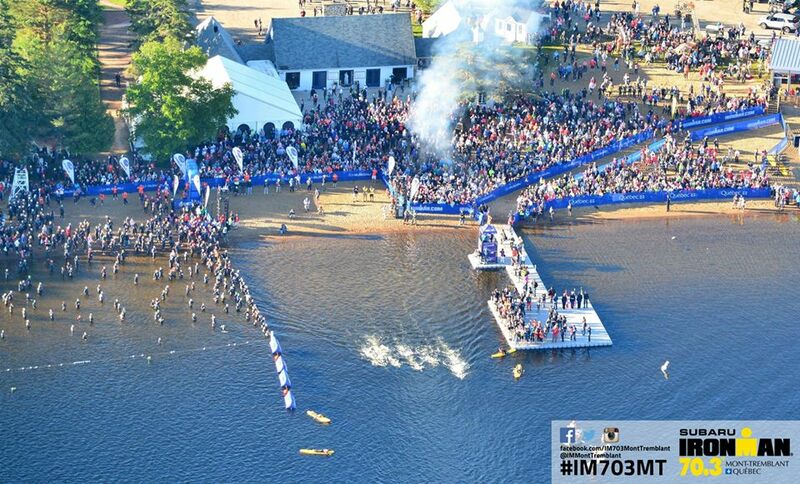 Now on to Mont Tremblant full Ironman in August!!! ← Tough Conditions, but another Kona PR!! !